Hello! 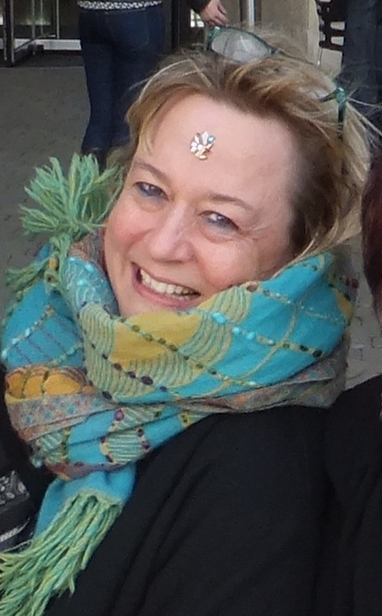 You’ve clicked the ‘about’ tab… So here’s a bit about me…I live with my husband Bob in a brick built Victorian semi in Winchcombe, a small town in the Cotswolds, England. Most of the rest of the town is built in honeyed cotswold stone, but this one isn’t…! I am the lead steward of the Fellowship of Isis (FOI) whose Foundation Centre is in my cousin’s family home in the republic of Ireland. The FOI was founded in 1976 by my aunts and uncle through their committment to connect together those wanting to balance and honour the expression of the feminine divine and her principals in today’s world. The need for this balance; to use the ‘tend and befriend’ response to threat rather than the more common fight or flight option, is just one example of how more feminine qualities could benefit our world and sadly is still relevant now as it was nearly forty years ago. I am supported in my faith journey through membership of the Unitarian church and have recently discovered that two of my English great, grandmothers came from Unitarian families too. In their time being a dissenter from the accepted Church of England was even more wayward than it is today when being a member of any church or faith group is unusual in our increasingly secular time. 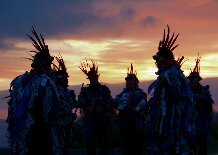 I dance with Happenstance Border Morris and here is an image of us on May Day morning as the sun rose over Cleeve Hill, the highest point of the Cotswolds, a mile from our town. The sky was stunning but the wind freezing so in deference to our musician’s frozen fingers we did a few dances and then tumbled down the hill to very welcome tea and crumpets!